My son, Anthony, is 13 this year. I am 42. I have been raising him alone without the benefit of his mother for more than 10 years. Until now I felt good about that job. I knew it was a noble thing to do and being a father was its own reward. Behind our innocent exteriors, however, my son and I are locked in a battle to the death, light sabers drawn, battling from the basement to the hallway of our house as though it were the dungeons and corridors of the Death Star itself. When Anthony was 2 years old, he was my best friend. I was Hans Solo to his Luke Skywalker. 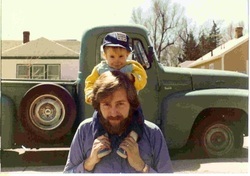 We lived in Colorado then, where we had an old green pickup truck with busted springs and half bald tires. It wouldn't go any faster than 45 mph. We had a big mongrel dog, named Tanima, who rode in the back of the truck and barked at anything that moved. My son had a plastic steering wheel that he gripped with white knuckles as we squealed around turns. Like Hans, Luke, and Chewy, we blasted ourselves into hyperspace, punching a hidden button that only we knew how to locate. Anthony's eyes were as big as quarters in those days. But that was a long time ago. Now, I can often have more fun picking lint off a sweater than going for a drive with Anthony. At first, I blamed him. After all, I'm no different. It is he who is growing up. It isn't just that he ignores me. Or that I am being replaced by new friends and "more important things to do." That is what I had expected to happen. But now, the truth is becoming clear. Anthony wants to fight me. At 13, Anthony has grown tall and straight, just two inches short of my own height. Soon, I know, he will be taller and stronger than I. Birthday cake no longer interests him. He has grown hungry for life and all the experiences that go with it. As it was with Luke Skywalker, it will be impossible to hold him back when the challenge comes to become a Jedi. He is in training already, I can tell. His composure is that of a man. As I envisioned our movie, I would be playing Obi-Wan. When Anthony became old enough, I would teach him the ways of the Jedi. But, looking into my son's eyes I can see that it isn't to be that way at all. I am being cast as Darth Vader. "This must be a mistake," I protest. In the mirror of my son's eyes, I can see the black mask being fitted onto my face. I feel the suffocating draw of the respirator around my mouth and nostrils. From here on out, I am the villain. A man raising a child alone is still an oddity in our culture. The bond between the two is different from that formed between other men and their sons. Different, because for the first decade of his son’s life, the man has to wipe the boys nose, clean his scrapes, make his lunches and dry his tears. In short, he is forced into an unfamiliar role, that of a nurturer and "mother." Being Mr. Mom for 10 years is OK. It has a million rewards. But it is lousy preparation for a fight to the finish on the Death Star. It is clear to me that Anthony has discovered something like "The Force" within him, but he still doesn't know what to do with that strength. As with all young man, however, his instincts are to attack something. He looks around for someone with authority, yet someone who won't destroy him if his aim is a little high the first time around. And finally, it must be someone strong enough to be a worthy opponent. Anthony's eyes are narrow now. And what I see reflected in them is unfamiliar to me. It is an adversary. Dark and ominous. An unbeatable and indestructible machine. All of this brings back memories of my own father when I was 13 years old. He was a doctor, busy saving people, while I was busy growing up. He managed to survive what I am thinking might kill me now. I used him for target practice, playing out my arrogance. At 13, I was a greaser. I smoke cigarettes despite his warnings that it was unhealthy, and I embarrassed him by dressing like a hood and using foul language. In his eyes, my behavior was painfully beneath the station he had worked to achieve. But he was a strong man, and I saw little reason to show any mercy. When, on occasion, I detected some damage, I thought only that at last I was making some progress. My own son has had a hard year. He grew 2 inches, went out for football, and made the team only to sit on the bench and never get a chance to play. His legs and armpits suddenly have enough hair on them to make him feel like a chimpanzee. He started going steady with a girl. He's discovered Clearasil and deodorant, and buys both with his own money. He is all elbows and knees, and he thinks no one likes him. He got a razor for Christmas, and his own telephone in his room. He has curly hair that he wishes were straight, has braces on his teeth, and has no idea what he wants to do with the rest of his life. Last week, he got into a fight. His braces tore up the inside of his mouth. I helped him clean up the blood and put some gauze in his mouth. He wanted to cry, but wasn't going to do that in front of me. After a minute, he acted as though it had never happened. The atmosphere grew tense. And, I could hear my breath, inhaling and exhaling through the respirator. Most of the time, we don't talk much anymore. Getting a simple answer out of Anthony is like trying to get Luke Skywalker to defect to the Dark Side. But one evening, we were sitting together on the porch. "Do you remember that old truck, Anthony? The way we used to drive around and hit hyperspace?" "Did that old truck ever run, Dad?" he asked, shaking his head in disbelief. "It's vague, Dad. Very vague." When I feel a light saber catch me behind the knees while I am getting a bowl of Frosted Flakes in the morning, I retaliate. "Anthony! Mow the lawn." I've grown fond of Darth Vader. I can empathize with his problems. And I'm willing to lose this battle with my son in order that he can win his war.